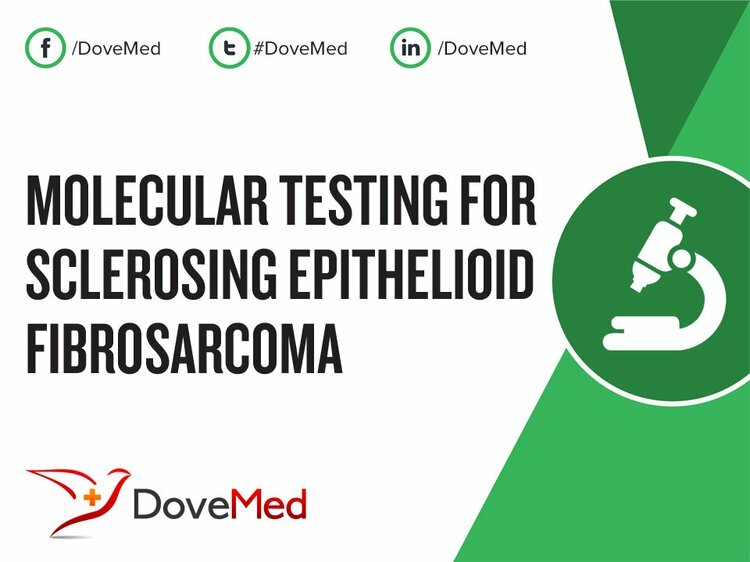 Molecular Testing for Sclerosing Epithelioid Fibrosarcoma is a genetic test that is helpful in aiding a diagnosis of sclerosing epithelioid fibrosarcoma. The methodology used for sclerosing epithelioid fibrosarcoma may vary from one laboratory to another. What are the Clinical Indications for performing the Molecular Testing for Sclerosing Epithelioid Fibrosarcoma Test? How is the Specimen Collected for Molecular Testing for Sclerosing Epithelioid Fibrosarcoma? What is the Significance of the Molecular Testing for Sclerosing Epithelioid Fibrosarcoma Result? Longquan, X., & Mwakyoma, H. SCLEROSING EPITHELIOID FIBROSARCOMA. Patterson, J. W., Tchernev, G., Chokoeva, A. A., & Wick, M. R. (2016). Sclerosing epithelioid fibrosarcoma. Wiener Medizinische Wochenschrift, 1-4. Doyle, L. A., Wang, W. L., Dal Cin, P., Lopez-Terrada, D., Mertens, F., Lazar, A. J., ... & Hornick, J. L. (2012). MUC4 is a sensitive and extremely useful marker for sclerosing epithelioid fibrosarcoma: association with FUS gene rearrangement. The American journal of surgical pathology, 36(10), 1444-1451. Rekhi, B., Folpe, A. L., Deshmukh, M., & Jambhekar, N. A. (2011). Sclerosing epithelioid fibrosarcoma–a report of two cases with cytogenetic analysis of FUS gene rearrangement by FISH technique. Pathology & Oncology Research, 17(1), 145-148. Wojcik, J. B., Bellizzi, A. M., Dal Cin, P., Bredella, M. A., Fletcher, C. D., Hornicek, F. J., ... & Nielsen, G. P. (2014). Primary sclerosing epithelioid fibrosarcoma of bone: analysis of a series. The American journal of surgical pathology, 38(11), 1538-1544. Prieto‐Granada, C., Zhang, L., Chen, H. W., Sung, Y. S., Agaram, N. P., Jungbluth, A. A., & Antonescu, C. R. (2015). A genetic dichotomy between pure sclerosing epithelioid fibrosarcoma (SEF) and hybrid SEF/low‐grade fibromyxoid sarcoma: A pathologic and molecular study of 18 cases. Genes, Chromosomes and Cancer, 54(1), 28-38. Doyle, L. A., & Hornick, J. L. (2013). EWSR1 rearrangements in sclerosing epithelioid fibrosarcoma. The American journal of surgical pathology, 37(10), 1630-1631. Bai, S., Jhala, N., Adsay, N. V., & Wei, S. (2013). Sclerosing epithelioid fibrosarcoma of the pancreas. Annals of diagnostic pathology, 17(2), 214-216. Elkins, C. T., & Wakely, P. E. (2011). Sclerosing epithelioid fibrosarcoma of the oral cavity. Head and neck pathology, 5(4), 428-431.